Ok, so you have your chunk of time off the floor to do your “programming”. What do I do? For most educators this time is precious and jam-packed with expectations! Depending on the centre, educators may have a focus group of children that is their responsibility to observe and program for, or may make a contribution to each child’s learning profile. Generally the term “programming” refers to documenting the learning journey of children. This may include completing observations or learning stories and providing some form of analysis on what has occurred within the observation. The educator will then provide an assessment of the learning, deducing a direction for future planning that may be incorporated into the larger educational program. Programming may also involve completing developmental or learning outcome based checklists that ensure educators are observing children with reference to typical developmental milestones. Each educator will observe children in slightly different ways, using a variety of different observation types: jottings, anecdotal and running records. Formats and presentation methods for observations will vary from centre to centre and evolve overtime. When I started as an Advanced Child Care Worker after completing my diploma, programming and planning occurred in the form of learning stories prepared for the families to see. Observations were completed in a full page format, with detailed observation, analysis and assessment of learning, with links to the “NSW Curriculum Framework for Children’s Services”, including references to the various developmental domains of the child. Feedback from families was that they loved the pictures of their children but that all the text was too technical and not very interesting. With the introduction of the Early Years Learning Framework, the focus of documentation and programming moved away from providing a product for families and towards meaningful and purposeful interactions with children. Programming remained a vital component of planning and providing an educational program for children, but the time spent per observation was reduced, allowing for more time spent engaging. There was still a lot of time spent writing out learning outcomes observed and having to cross reference ideas and observations through big piles of paper. As I completed my Teaching Degree, I saw the introduction of digital documentation making programming simpler still. 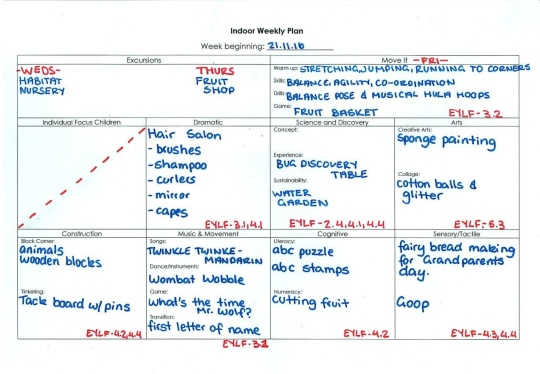 Observations can be posted to the centre’s private Kinderloop quickly on the floor with children or in down times during the day and added to my programming group (see how here). In my programming time all I have to do is search for observations tagged with my group (generally private posts) and I can analyse and assess the learning of the children observed (either by editing the post or by adding my assessment in the comments section). I don’t have to write out the learning outcomes I have observed any more as it is simple and easy to add a tag to the observation. Developmental areas may also be identified and tagged, making it super fast to complete developmental checklists if required or complete more detailed reports that may be required for external sources (for example for primary schools in the case of those in their last year of preschool). Linked families have access to all of the observations completed on their child in the form of public (white) posts with a small jotting. I am able to duplicate the posts seen by families and create private (yellow) posts seen only by educators, and add the detail I need to conduct an analysis of learning and development. These private posts can then include the centre based curriculum directions and follow up required under the National Quality Standard and may even include links to the Quality Improvement Plan of the centre, which is often not relevant to families. Programming is a vital component of the day-to-day running of an early childhood education centre. It can be daunting; with limitless possibilities for representing the learning of children. Kinderloop allows for educators to streamline the programming process, limiting duplicating data and allowing for more time spent implementing the planned program with the children.